Imagine a world where web services are sold like fruit and vegetables, where digital information is so everyday that you just consume it like food or drink. Sounds a bit far-fetched perhaps. But experiments done by a graduate researcher at London's Royal College of Art, Indri Tulusan, shows this might be what people actually want. 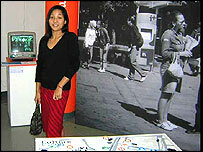 She collaborated with CitySpace, a company responsible for putting internet kiosks on our streets. She was asked to look at how effective these kiosks were and compare them with forms of technology accessed in the streets of other countries. "In Cambodia a TV placed on a market stall becomes a form of street cinema, and in Bolivia there's the human phone box," she told BBC's World Service programme Go Digital. "Someone walks the streets with a mobile phone, charging by the minute," said Ms Tulusan, who is a Research Associate in Interaction Design at The Helen Hamlyn Research Centre at the Royal College of Art. Indri took this idea of how people already interact on the streets, shopping, having conversations, queuing, and developed the idea of throwing in technology. "I looked at ways of having people at the centre of the infrastructure where digital services could be offered like fruit and veg." She sees this as providing a much more personal and fluid service than static internet cafes or web points. From this, Ms Tulusan developed the "webpacker". The concept is very simple. 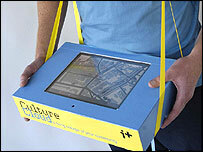 Disguise a touch screen computer, attach it someone and have them walk around with it, linked to a wireless network. "Anyone can just go there and ask for a bit of internet or can you give me some data," she explained. To test the idea, Ms Tulusan tried it out in north London. People seemed willing to interact with this computer with a human face. She found older people were particularly keen and even managed to get pensioners at a day centre to use the mobile webpacker for writing online diaries. Is wi-fi good for developing nations?